Drosophila antennae is gaining attention to study the hearing molecules and its mechanism in last few decades. Various molecules required for the formation of hearing organ is conserved between Drosophila and human being. This suggests Drosophila can be used as a model organism to decipher the vertebrate hearing mechanism. In this context a protocol describing the fixation, sectioning and staining of antennae is lacking from the literature. 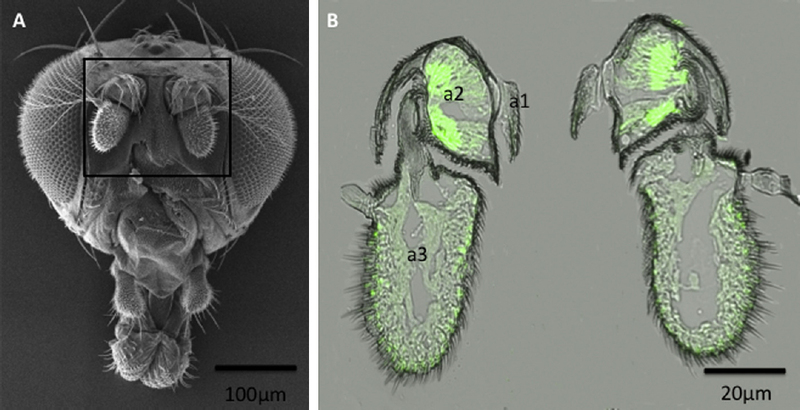 The current paper describes various commercially available markers of the antennae to visualise it under confocal microscope. Manganese (Mn) is an essential metal commonly found in the environment and is used for industrial purposes. Exposure to excessively high Mn levels may induce neurotoxicity referred to as manganism. This work was conducted to study the effect of manganese on the olfactory bulb of adult male albino rat and the possible protective role of meloxicam. Forty adult male albino rats were equally divided into four groups: control group, meloxicam-treated group (5 mg/kg/day orally for 4 weeks), MnCl2-treated group (10 mg/kg/day orally for 4 weeks), and the fourth group received both meloxicam and MnCl2 at the same doses and duration. Specimens of the olfactory bulbs were prepared for light and electron microscopy. An immunohistochemical study with a quantitative morphometry was performed using antibodies against glial fibrillary acidic protein (GFAP). The control group and meloxicam-treated group showed the same normal structure. MnCl2-treated group showed shrinkage of mitral nerve cells with dark peripheral nuclei as well as disorganization of mitral and granule nerve cells. The surrounding neuropil showed vacuolar spaces. Ultrastructurally, the mitral cells showed accumulation of lysosomes, swelling of mitochondria and irregularity of the nuclei. The nerve fibers contained swollen mitochondria with splitting and irregularity of the surrounding myelin sheaths. GFAP immunoreaction showed a highly significant increase compared to control group. 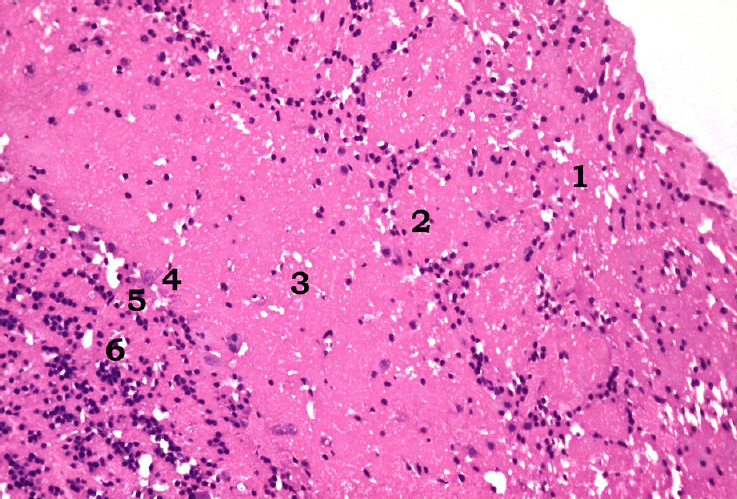 On the other hand, the group that received both meloxicam and MnCl2 showed less marked histological changes. It was concluded that manganese induced structural changes in the olfactory bulb of albino rat that were ameliorated by concomitant use of meloxicam. The role of Bcl-2 in initiation and progression of endometrial carcinoma is still with inconsistent results. The aim of this study is to determine the role of Bcl-2 in endometrial tumorigenesis. It is a retrospective cross sectional study. We used 100 endometrial paraffin embedded specimens for Bcl-2 oncoprotein immunohistochemical staining; 20 samples of normal endometrium, 40 specimens of endometrial hyperplasia (simple, complex and atypical) and 40 specimens of endometrioid adenocarcinoma. The results were statistically analyzed. There was a significant increase in Bcl-2 staining from normal through complex and atypical hyperplasia into well differentiated adenocarcinoma (P =0.002, P =0.0008 and P =0.0001, respectively). There was a significant difference between the staining of different types of endometrial hyperplasia; as it up streamed from the simple through the complex up to the atypical types (P <0.05). Bcl-2 staining showed no significant correlation with the moderately, poorly differentiated and the different stages of adenocarcinoma (P =0.6, P =0.29 and P =0.1 respectively). 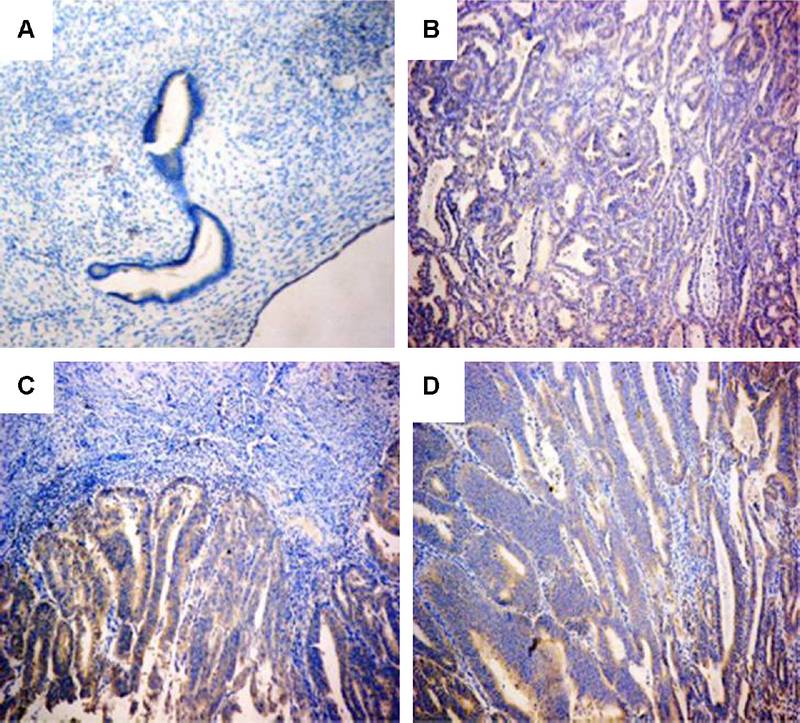 These results might indicate a substantial role for Bcl-2 as one of the initiating drives for endometrial tumorigenesis, but not in further tumor progression. The study aims to determine the prevalence of anemia in apparently healthy university female students. This study was conducted in 2007–2008 at Taibah University and a total of 268 female students participated in this research. In order to assess iron deficiency and iron deficiency anemia, the venous blood samples were collected from consecutive female students at the medical center of Taibah University excluding those already on iron supplementation for iron-deficiency anemia. One hundred and seventy-one (64%) students were found to be anemic. The overall prevalence of mild (10–11 g/dL), moderate (7–10 g/dL), and severe (Hb <7 g/dL) anemia was 45%, 49%, and 6%, respectively. Out of the anemic students, 81% showed microcytic (MCV <80 fL) and 1.6% had macrocytic (MCV >96 fL) variety. The results of this study warrant further evidence-based surveys on a larger scale to validate these findings and eventually set a stage to develop well-organized educational and nutritional programs to safeguard and improve the nation’s health. The high prevalence of iron deficiency anemia in the present study might be related to life style of female students as well as to their dietary habits. It is recommended that female students never skip breakfast as it is essential for their cognitive functions and physical activities. 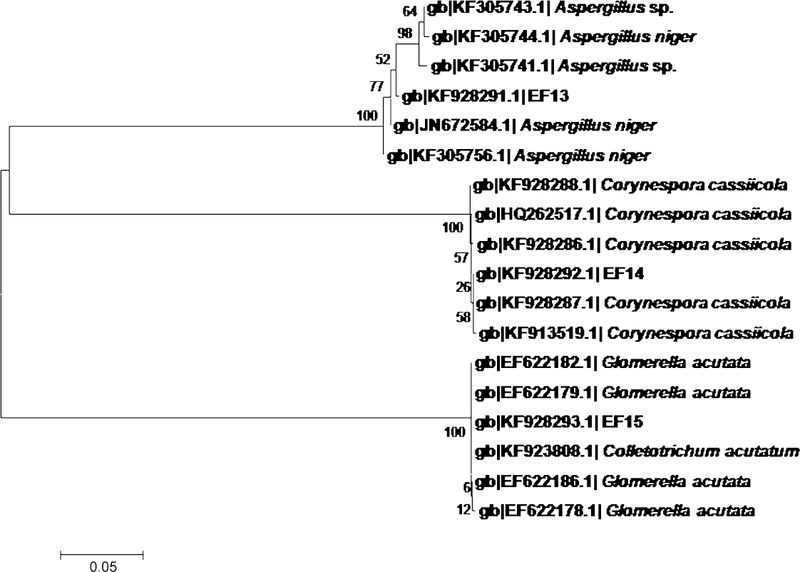 Three endophytic fungi Aspergillus tamarii PFL2, Aspergillus niger PFR6 and Penicllium ochrochloron PFR8 isolated from an ethno-medicinal plant Potentilla fulgens L. were used for the biosynthesis of silver nanoparticles. Scanning and transmission electron microscopic analysis were performed to study the structural morphology of the biosynthesized silver nanoparticles. The electron microscopy study revealed the formation of spherical nanosized silver particles with different sizes. The nanoparticles synthesized using the fungus A. tamarii PFL2 was found to have the smallest average particle size (3.5 ±3 nm) as compared to the nanoparticles biosynthesized using other two fungi A. niger PFR6 and P. ochrochloron PFR8 which produced average particle sizes of 8.7 ±6 nm and 7.7 ±4.3 nm, respectively. The energy dispersive X-ray spectroscopy (EDS) technique in conjunction with scanning electron microscopy was used for the elemental analysis of the nanoparticles. The selected area diffraction pattern recorded from single particle in the aggregates of nanoparticles revealed that the silver particles are crystalline in nature. Three endophytic fungi isolated from different parts of Hibiscus sabdariffa L. were identified using morphological and molecular approaches. Ethanolic extract of endophytic fungi as well as plant extracts were evaluated for in vitro antibacterial activity by using well diffusion method and their minimum inhibitory concentration estimated. The culture extract of one endophytic fungus Glomerella acutata EF15 was found to be potent antibacterial agent against pathogenic coliform bacteria Klebsiella pneumoniae and Escherichia coli responsible for causing clinical mastitis. Scanning electron microscopy (SEM) revealed the ultrastructural alteration in the cells of K. pneumoniae and E. coli when treated with crude ethanolic extract of G. acutata. The ethanolic extract of the endophytic fungus revealed potential to be bioprospected as antibacterial agent against pathogens causing coliform mastitis, the existing havoc of dairy industries. The morphometrical and morphological features of the infundibulum and ampulla of the uterine tubes of adult cattle were studied. The materials used in this study were consisted of 12 pairs of uterine tube of healthy cows at age of 16–36 months, collected from Assiut slaughterhouses. Through observations of the ovaries, follicular and luteal phases of estrous cycle of each cattle were specified. Semithin sections of ampulla and infundibulum at follicular and luteal phases were made and histochemical analysis of the ampulla by use of PAS, Alcian Blue, Sudan Black B was also done. In addition, acid phosphatase activity of the ampullar epithelium was demonstrated. Histological analysis of the epithelium of bovine oviduct revealed that it was consisted of non-ciliated secretory cells, two populations of ciliated cells (CC), basal cells and Peg cells. At the luteal phase, the secretory cells possessed many cytoplasmic protrusions that extended beyond the luminal borders of the ciliated cells and exocytosis of secretory materials was observed. While at the follicular phase, the ciliated cells were predominated. The histochemistry of the ampullar epithelium revealed increase in secretions of neutral, acidic mucopolysaccarides and lipid from the secretory cells at the luteal phase with moderate acid phosphatase activity. Histomorphometric examinations of infundibulum and ampulla indicated that the mean number and height of primary folds as well as the thickness of the epithelium were increased significantly at the follicular phase.